What is the current status of the maintenance facilities of The Ukrainian Air Force? Ground equipment, supply of parts, quality of training, influx of new technicians, overall morale of the personal? - As of the time of writing, this year's graduating class (comprising more than 80 students) already had, for the most part, between 90 and 170 flight hours. The (aspiring) helicopter pilots are the exception, with over 30 hours on average. - During the worst years of the Ukrainian Air Force, when it was financially starved to near-extinction, students would graduate with just a few flight hours, and even many pilots in combat units had less than 50 flight hours (total!). - The key change that was made with this class, and a historical first for the school, is that the students already moved from training aircraft to combat aircraft before graduation, flying Su-25s, Mig-29s, An-26s, Mi-8s and Mi-24s. In general, Ukraine is now trying to meet NATO standards in terms of annual flight hours for military pilots. The Ukrainian Air Force is currently also getting training from the California Air National Guard. The aircraft were carried out on convoys of four trucks each: one with the fuselage, one with the wings, one with the tail parts, and one with the engines and other equipment. The aircraft were transported to Bulbakino Air Base in Mykolaiv oblast on mainland Ukraine. Reportedly, the UkrAF at Belbek Air Base in Crimea only had 4 Mig-29s (one of which a UB) in flyable condition, along with one L-39. These aircraft were quickly disabled by the Russians. 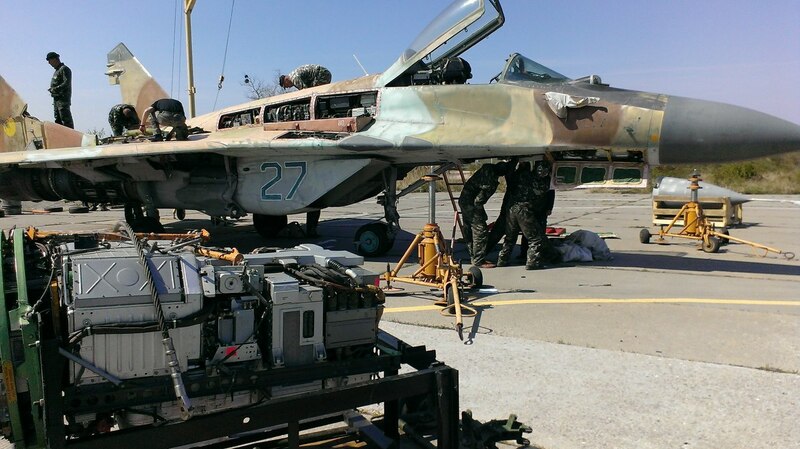 The Russians reportedly also stole many parts of the Ukrainian aircraft. Air Forces Monthly's June edition has a very informative article on Kulbakino Air Base, which it labels "Ukraine's superbase". Kulbakino is the home base of the 299th Tactical Brigade, which operates Su-25s, and currently also hosts the 204th Tactical Brigade and the 10th Naval Aviation Brigade, which relocated to Kulbakino from Crimea. 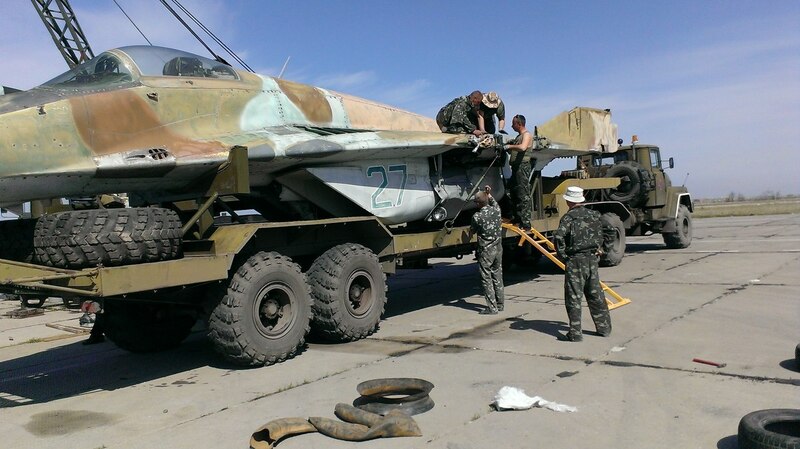 The 204th Tactical Brigade is the Mig-29 unit that was formerly based at Belbek Airbase near Sevastopol. According to the article, the 204th Tactical Brigade has been rebuilding its operational strength to well beyond its pre-war levels. It lists 10 Mig-29s that are now in active service - 6 (including 1 UB) that have been repaired and restored to service by the brigade's technicians after being evacuated from Belbek, and an additional 4 (including another UB) that were overhauled at the Lviv State Aircraft Repair Plant. A further 3 Mig-29s were sent to the Lviv State Aircraft Repair Plant in August 2015 and should return to active service in the brigade in the course of this year. In addition, the 204th TB has two L-39M1s in active service. This renewed strength has allowed the brigade to take over the Quick Reaction Alert (QRA) role from 4 Su-27s who were temporarily based at Kulbakino. These four Su-27s have now been relocated to Shkilniy Airbase (the military side of Odessa International Airport), where they continue to contribute to the air defense of the Air Command South area. Long-term, there are tentative plans to relocate the 204th Tactical Brigade to Martynivka / Voznesensk Airbase, and the 10th Naval Aviation Brigade to Ochakiv Airbase. However, both bases would need a significant overhaul to be able to host these units. These relocations would, however, solve the current congestion problems at Kulbakino. 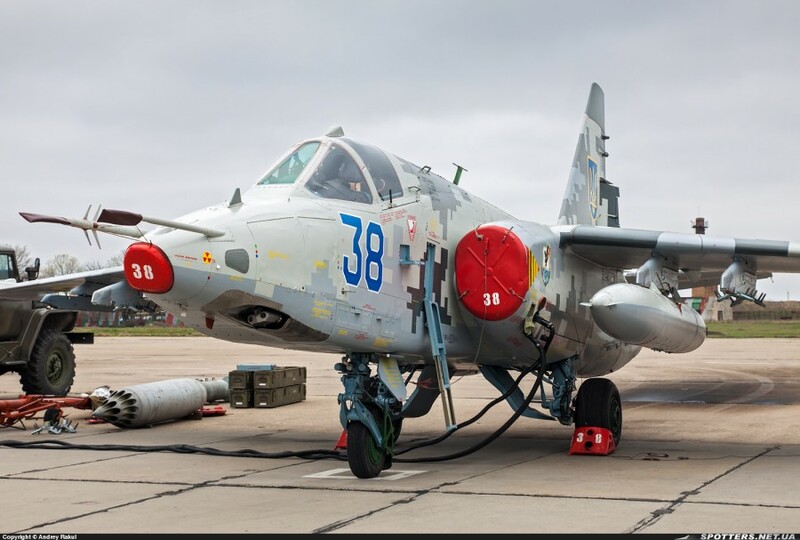 On July 14, the Ukrainian Air Force lost Su-25 "38 blue", an upgraded M1 model. 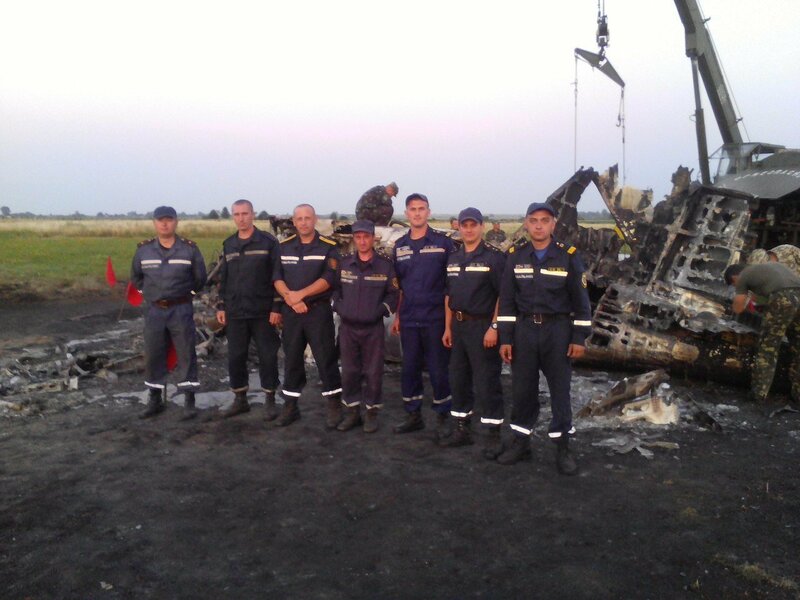 The plane caught fire during operations at Starokostiantyniv Air Base. The pilot ejected and survived. Also spectacular - coordinated footage from the cockpit and the ground of an UkrAF Su-24 overflying the coastline and beaches of Odessa oblast during exercise Sea Breeze 2016. Footage of L-39 training operations from, interestingly, Odessa. The frames involved seem to belong to the 299th Brigade Tactical Aviation, which operates Su-25s out of Kulbakino. 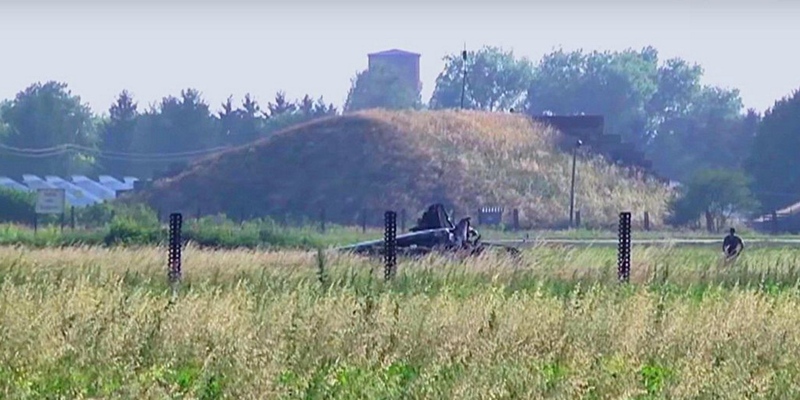 This is supported by the fact that they seem to be practicing bombing raids and two Su-25UBs can be seen in the background in some of the footage. Presumably, the 299th BrTA has moved some or all of its basic training operations to Odessa, in order to ease congestion at Kulbakino. In the run-up to Ukraine's Air Force Day (August 7), the 40th Brigade Tactical Aviation (based in Vasylkiv, Kyiv Oblast, and flying Mig-29s) held an open-door day. In particular, they showed how pilots were being trained on flight simulators. One of the things said in the reports is that, before the war, pilots used to fly only about once a month. Now they fly 2-3 times a week. And they spend a lot of time on the flight simulator in between actual flights. Here is footage of a similar flight, taken from the cockpit. It does not seem to be the same flight, as the shadows show ordnance below the pylons. The 2015 footage was of a helicopter with nothing hanging from its pylons. On a related note, where did Ukraine get the Su-27 and Mig-29 in 2015 from? Looks like two each? I suppose Russia is out of the question. 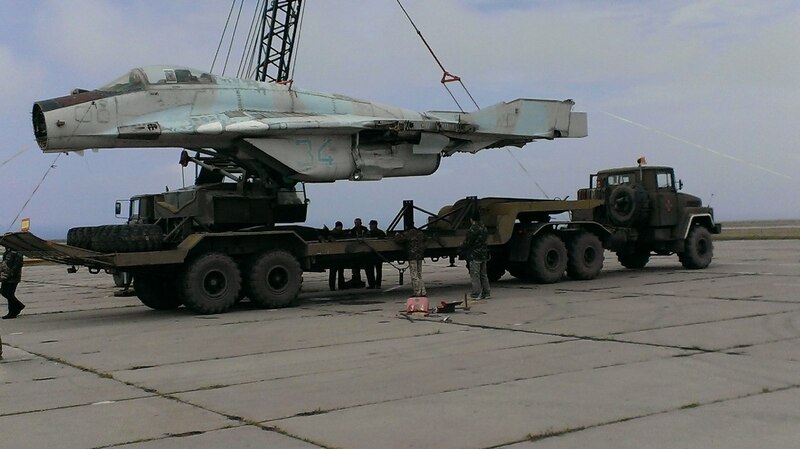 From the large stocks of former Soviet aircraft left behind in Ukraine in a non-flyable condition. 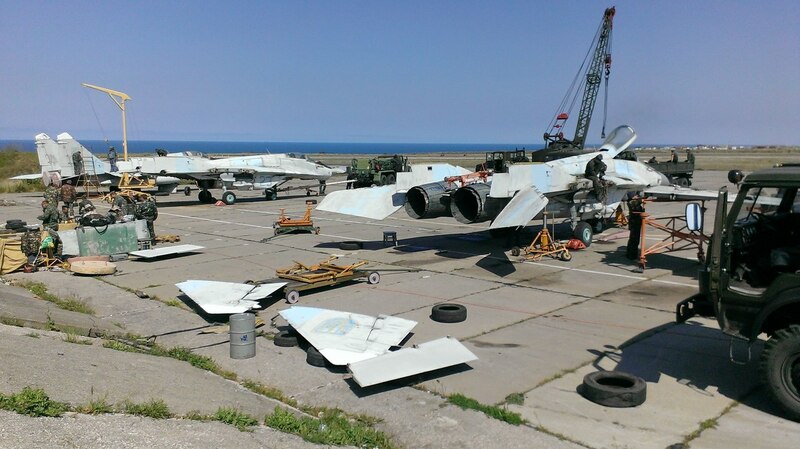 As an example, when Russia took Crimea, they found 45 MiG-29s at an airbase there, by far the most of the in a non-flyable condition. These were returned, and are among those being put into service now. How many are actually in flyable condition or operational? I find it doubtful that they will ever get a fraction of those types operational again though. 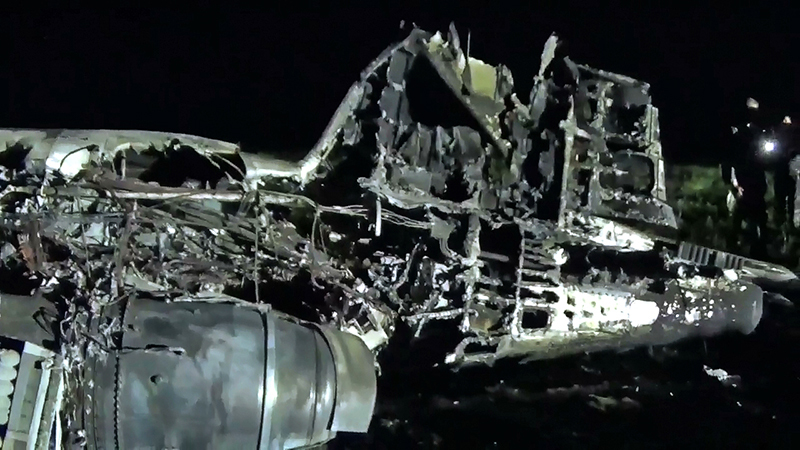 The majority of non-operational frames are probably deteriorated beyond the point of return, and Ukraine has a miniscule budget, even by eastern-European standards. Even looking at the ground forces, they have so far failed to bring back more than a handful of the 10.000+ tanks they inherited from the USSR, and tanks can withstand (even bad) storage conditions considerably better than a combat aircraft, and is much easier to upgrade too. The Flight International data are outdated. The Ukrainian-language Wikipedia page on Ukraine's Air Force Equipment Inventory quotes data from the International Institute of Strategic Studies' 2016 and 2017 editions of "The Military Balance". These numbers are a lot closer to the current reality. Even these numbers are not fully up-to-date or accurate, though. The number of operational Mig-29s must be around 45 as of today. The Air Force has as least 3 operational An-30s, not 1. The number of operational Il-76s is currently 6 or 7. On the Army side, the Mi-2 has been put (back) into service. As for the Navy, the Be-12s are in (more or less) operational condition but not being used any more. There are three operational Mi-14s. The fourth has not flown in years, but is currently being repaired at Aviakon in Konotop. The Navy has four Ka-29s, but none are operational. Efforts are supposedly ongoing to restore at least one of them to service. "A handful" is a bad exaggeration. Ukraine has restored several hundred tanks to service since the start of the war with Russia. Ukrainian media are reporting that the Ukrainian Air Force will participate in this year's Royal International Air Tattoo, for the first time since 2011. An RAF delegation reportedly visited Mirgorod Airbase in recent days to discuss the participation and air display. The UkrAF representation at RIAT will reportedly consist of Su-27 "58 blue", Su-27UB "71 blue" and an Il-76. It lists the Ukrainian Air Force as invited but not confirmed. To mark Ukraine's Air Force Day, President Petro Poroshenko on August 5 flew from Vasilkiv Air Base near Kyiv to Vinnytsia Air Base (in western Ukraine, and the location of the headquarters of the Ukrainian Air Force), in the back seat of a Mig-29UB (board number 30 white). The Ukrainian media were correct, and the UkrAF indeed participated in RIAT with these frames. It was not only the first participation of the UkrAF in RIAT since 2011, but also the first time since the 1990s that the UkrAF gave a flying display at RIAT. In 2011, it only sent a Su-27 and Il-76 for the static display. The As The Crow Flies trophy for the best overall flying demonstration as judged by members of the Friends of the Royal International Air Tattoo was presented by RAFCTE Non-Exec Director Dr Jim Glover to Sukhoi Su-27P1M pilot Col Oleksander Oksanchenko of the 831st Guards Tactical Aviation Brigade, Ukrainian Air Force, from Myrhorod air base. It was the first time a Ukrainian 'Flanker' had taken part in the RIAT flying display for 18 years. Speaking through an interpreter, Oksanchenko said: "Thank you very much for your hospitality, your partnership and to all the guys who organise the Royal International Air Tattoo. A very high standard is set, and we are very happy to be here. Everything is well organised. God bless your Queen!" The Ukrainians had prepared four different displays, with the choice to be determined by the weather circumstances. The poor weather and low clouds resulted in a low-level display. In another first, it has been announced that at the Czech International Air Fest (CIAF) 2017 on September 2-3, the UkrAF will give flight displays not just with a Su-27, but also with a Su-24M. 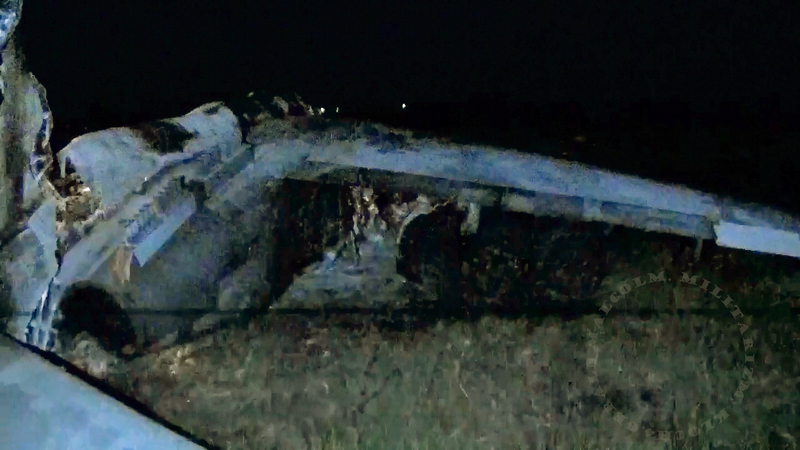 A Ukrainian Air Force L-39 crashed yesterday. Both pilots perished. 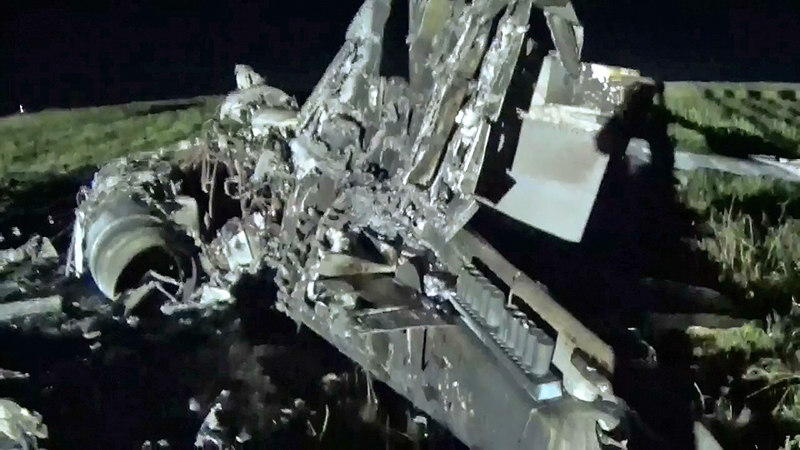 It seems that the aircraft belonged to the 7th Tactical Aviation Brigade, operating from Starokostyantyniv. Ukraine is currently hosting the largest international aerial exercise in its history, "Clear Sky 2018". Today, in the context of this exercise, a UkrAF Su-27UB crashed, killing both pilots. One of the pilots is reportedly an American.